For more than 10 years, customers have turned to Harry's Pizza in McMurray, Pennsylvania, for delicious Italian pizzas in a friendly, family restaurant atmosphere. That's because our chefs bake delicious flavor into every bite, whether it is for lunch or dinner, a large pizza or a personal pizza. The Neapolitan is our featured menu item. Though its recipe hails from Connecticut, it is the best recipe we have ever had. This pie is prepared on a pizza stone at 600 degrees, and it can be finished with any number of our more than 30 topping choices—all with red and white sauce. 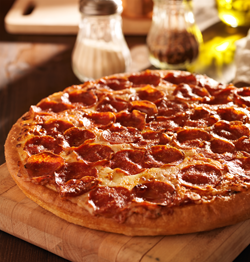 Our dough is made fresh daily—this is what makes our crust so great. In addition, we use fresh, local produced that is delivered daily for maximum taste and a menu that rarely changes. Enjoy our pizzas with a beer or wine when you dine with us. We feature eight varieties of white and red wines, and we offer 20 different kinds of domestic and import bottled beers for you to choose from. and be sure you ask about our featured daily pizza. It is typically $4.00 off.